Last Saturday I spent my evening with my entire family... all 35 of them that live here in New Jersey. And it was amazing. We boarded the Spirit of New York and had a beautiful night celebrating the life of my 88 year old grandma. But more details on that soon... for now I wanted to share what I wore that night. Fall fashion is officially in style, everything from tweed, to velvet to the 90's trends and I am in love. 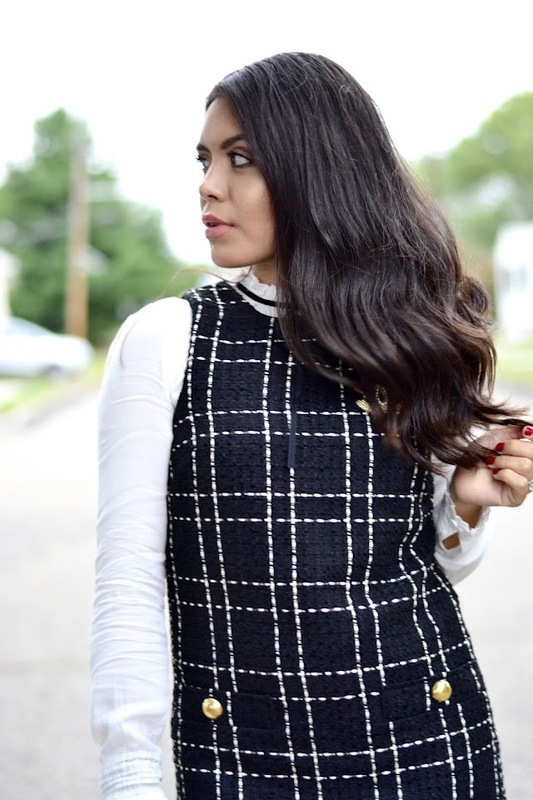 I picked up this short tweed dress at Forever 21 a couple day before the event and fell in love I paired it with this white blouse with gorgeous detail on the neck and wrists. I love that I can always count on Forever 21 whenever I have no clue about what to wear. I love this fall look, it's easy, it's stylish, a little trendy and totally classy. It remind me of Sher from Clueless a little bit:) love that movie. On another note... I've been gathering up ideas on DIY costumes for Emme. I love to have fun with her since Ben no longer let's me choose his costumes! He is 5 and he wants to be a dinosaur, every day, every year. So I let him. But that doesn't mean I can't have fun with Emme! If you don't follow me on Insta you should! I will be sharing a couple of funny and cute costumes I am cooking up! I'm obsessed with this look! You look stunning amiga!!! !